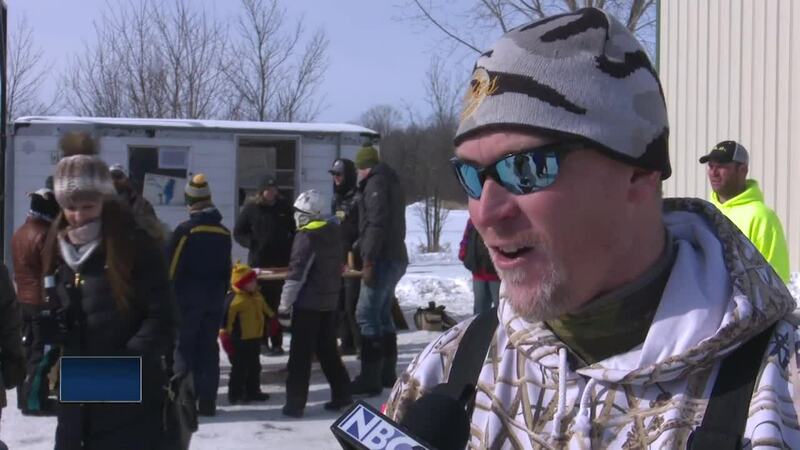 The long wait is over for sturgeon spearers in Northeast Wisconsin. LAKE WINNECONNE, Wis. — The long wait is over for sturgeon spearers in Northeast Wisconsin. On Saturday, the season officially began. Spearers went on the ice and patiently waited for a chance to stab a sturgeon. Some people got lucky on day one. "(I've) never actually speared a sturgeon before," Brian Perzentka said. "This is the first sturgeon I actually saw because you usually sit for hours and hours and you don't see much, so it was pretty exciting." Spearing veterans also got some new stories on Saturday. "This is number 15 for me," Lee Clark said. "I got my first one when I was 16." Today's sturgeon ties his biggest one ever at 73 pounds. Clark said that he's not always this lucky. "It's just a very, very good treat to get one," he said. "I missed one last year, so it was nice to get a little redemtion today." Most spearers that we spoke with said they speared their sturgeon on the upper lakes. "There's a much higher success rate for spearers on the up river lakes than there is on Lake Winnebago every year," DNR biologist Ryan Koenigs said. However, Lake Winnebago already brought in a record breaking sturgeon on opening day. "There was a 171 pound sturgeon registered," Koenigs said. "The fish was 85 and a half inches long, so that fish is actually over an inch longer than our current state record."